I usually treat the iPad’s home screen differently from the phone’s home screen, mainly because my speed requirements are different. On my phone, the most commonly used apps tend to be on the first page of the home screen – the goal is to complete a task as fast as possible after unlocking the device (read What’s on my phone’s home screen?). However, on my iPad I keep apps organized by task category, with the objective of placing related apps as close to each other as possible. The Dock is central to anything I do with the iPad, from watching a movie to writing a blog post. I keep it tidy with only four apps that let me do the most important tasks I can do: browse the web, check my calendar or email, and access the device’s settings. Safari is my main browser because it integrates perfectly with iCloud Keychain and it usually works great when requesting the desktop version of most websites. Apple’s Calendar app brings together all my calendars. Gmail on iPad is able of showing emails organized by labels, my top requirement when it comes to email. As I said before, I organize apps by task category. What this means is that when I’m using my iPad to spend a few hours entertained, I like having all the possible apps I could choose on the same screen. Given the abundant available real estate, this organization makes the iPad screen feel like a delicious menu. I’m not a big iPad gamer, especially since many games are based on rewards and crazy time investments (like SimCity or Crazy Taxi), but Inside has a special place in my heart and I totally recommend it if you like puzzle games; its ambient music and light treatment is worth the price of admission. The video streaming world is divided by many apps nowadays, so I have a broad selection on my first home screen page. You can find the usual suspects, like Netflix, Prime Video, YouTube or Hulu, but also some niche apps like Twitch (I don’t like playing Sea of Thieves, but watching other people play it is fun!) or the Spanish TV apps RTVE alacarta and TV3. This is a testament of how ridiculous the situation has become for cord-cutters, I may not pay for cable TV but I’m still a slave of several subscription-based services. Reading is a big part of my life, and I can’t live without Microsoft News (which aggregates newspapers from Spain where Google News doesn’t), Feedly (the best substitute for good ol’ Google Reader), Kindle and Twitter. Instagram is the only social network where my friends still post personal content, so it’s also a must on my first page. Amazon gives every employee in engineering a laptop, so that they can work remotely; I always work directly from it since the VPN is already set up, but it’s nice to have access to my email, meetings and online design documents here too. Apple’s Mail app is easy to configure with Amazon’s network, so it’s a good complement to Chime and WorkDocs (corporate apps for Amazon employees). Most of my friends have already abandoned Facebook and they only use it to consume memes, news or other interesting articles. I use it to share what I write on geekonrecord.com and hackernoon.com. I do the same with LinkedIn and Medium; I have found that those are great apps for reaching out to other tech professionals. Writing a post requires a myriad of apps, starting with Google Docs (which makes it easy to share content with my editor), OneNote and Paper (where I sketch ideas), Photos, Over and PicsArt (for image composition), and Google Drive or OneDrive (for file storage). I also consider Stocks, Google Maps and Amazon productivity apps, but they are unrelated to work or writing. 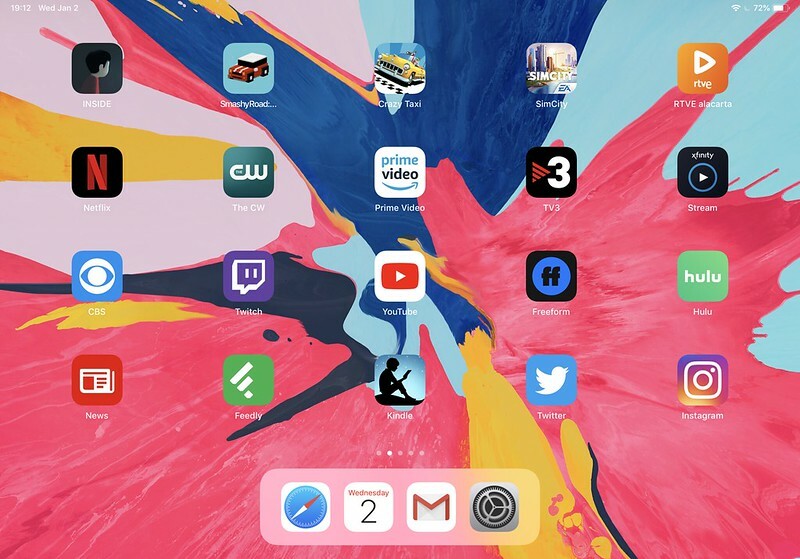 The third and fourth home screen pages contain communication apps like Skype or Messenger, and other stock Apple apps or background utilities like content blockers, so I won’t bore you with the details. 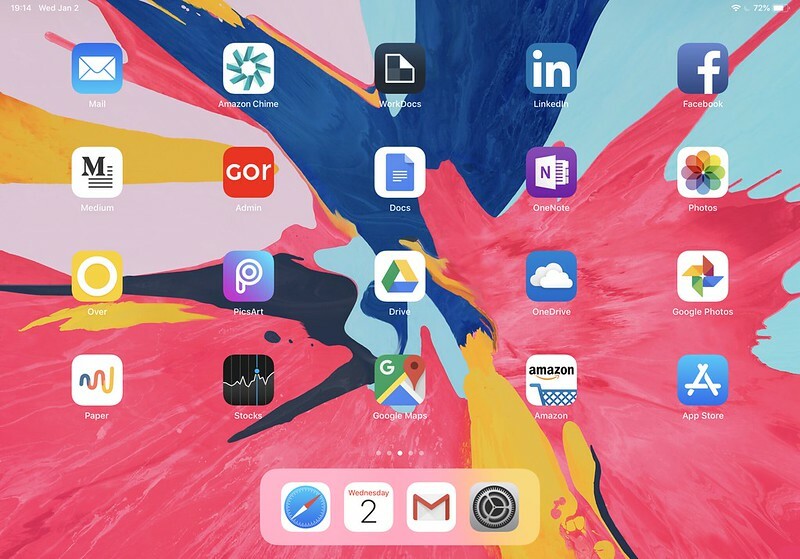 The bottom line is that having the right home screen organization is all about reducing friction between you and the device; distributing apps by task category in different pages might not work for you, but once you find the right place for all your apps, using your iPad should become intuitive and effortless. What about you? What tips and tricks do you have for organizing your iPad home screen?